ECS didn't change the name of this motherboard after the new revision of Intel P67/H67 chipsets had been released. Like some other manufacturers, they just put a large sticker saying "B3 stepping" onto both box and PCB. (Just in case, visit this page for company's official stance on the whole issue.) I actually had the older version of the motherboard for review, and the hyped bug had no effect on test results whatsoever. So, company's P67H2 lineup currently includes four boards with suffixes ranging from "A" to "A4". But similar names, black PCBs and typical features are the only things these boards have in common. For example, each features a different approach to graphics card support, and perhaps you'll consider the seemingly lowest-end A4 (which isn't even a part of company's top-end Black Series) the perfect choice. As for P67H2-A2, it does belong to the Black Series, but all its peculiarities are surprisingly few expansion slots and a different USB 3.0 controller manufacturer. ECS P67H2-A2 doesn't look like a regular ATX motherboard which it is. Just five expansion slots? Come on now! Note that PCIe x16 slots are divided not by one but by two other slots. This way ECS suggests that you install a powerful graphics card that may occupy three expansion slots instead of two. But if you would like to install a SLI couple, you will lose at least one PCI slot anyway. Some may think that P67H2-A2 has more 'extreme' than it has sense. At least one extra PCIe x1 slot between the two graphics slots wouldn't have added much to retail price. On the other hand, the demand for expansion cards has plummeted since the adoption of the ATX standard with its 7 expansion slot placeholders. And note that if you install two graphics cards, those will work as x8+x8, because P67H2-A2 offers what a suitable processor may offer. 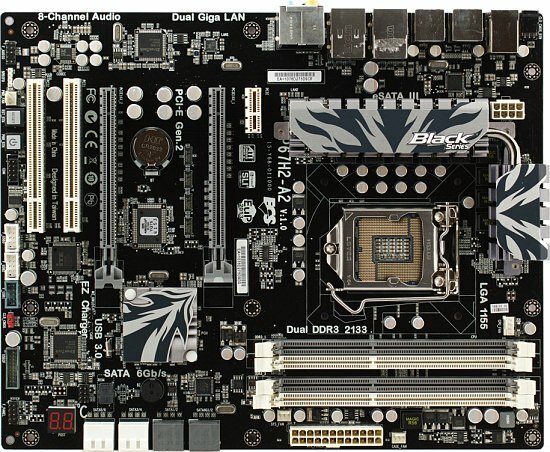 Other peculiarities include the uniform gray-black-white color scheme of all parts and connectors, including the camo designs on heatsinks. Except few expansion slots there's really nothing serious to complain about: all cards and cables can be conveniently plugged in and removed, the indicators are visible. The Power/Reset buttons may be obstructed, if you install a card into the last PCI slot and you have a compact PC enclosure. But these buttons are typically used when the machine is open anyway. The Clear CMOS jumper is also not quite reachable, but there's a more convenient button on the backpanel. Also note there are no IDE or FDD interfaces. The CPU VRM has 4 CPU phases and 1 System Agent phase, but the former four are artificially doubled to make 8 'virtual' phases. What's more important, each 'virtual' phase has a couple of MOSFETs, so CPU circuitry as a whole is ready for some serious current needed for overclocking. In turn, the System Agent (and memory modules) phase has three MOSFETs. All MOSFETs are low RDS(ON), but that's standard for a mid-end motherboard these days. 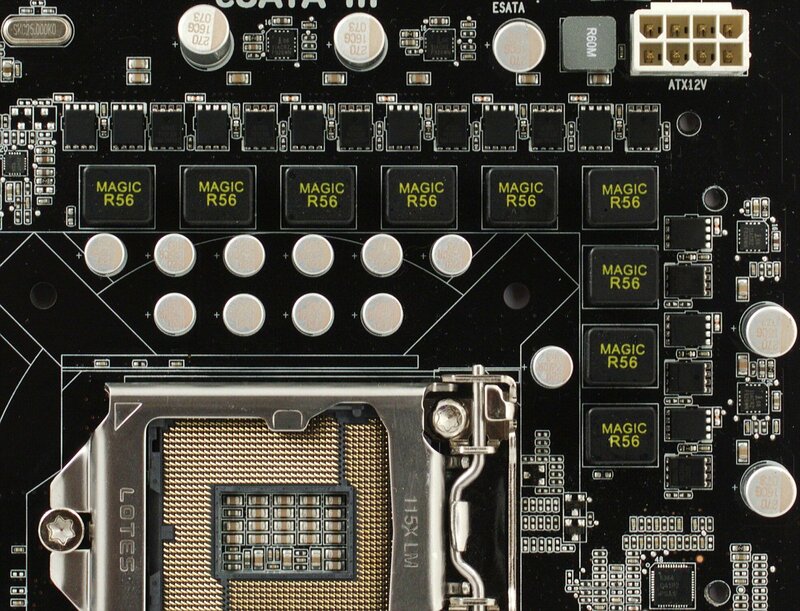 ECS is claiming that there's a thicker layer of gold covering CPU socket pins (15µ Gold Contact), but it's not visible to the naked eye despite brighter-colored images posted at the ECS website. Besides, it's not clear in what situation this thicker layer of gold may be important, because actually burning a processor would require some very insane overclocking. The large number of MOSFETs also lowers requirements to cooling this part of the motherboard. Despite that manufacturers still continue to mount large heatsinks and occasional heatpipes, although the latter are simply not needed, because hot Northbridges are a thing of the past. For the sake of justice, I should say that heatsinks on P67H2-A2 don't prevent you from installing more or less typical CPU coolers or plugging in fan power connectors. And they cool down the MOSFETs as well as the surrounding area. So consider them a not essential but nevertheless pleasant addition. All the more so because they are fixed by metallic screws. The chipset (or rather the remaining 5W Southbridge) is cooled down by a low-profile semi-decorative heatsink and has no overheating issues whatsoever. It also doesn't prevent you from installing long expansion cards. Another peculiarity visible with the naked eye is the POST indicator that also shows CPU temperature and may really help you in case of problems. The BIOS has traditional text-based interface, so I won't have to describe yet another creative UEFI GUI allowing you to disable a couple of peripheral controllers and change the order of bootable drives. Like all modern motherboards, ECS P67H2-A2 supports a couple of USB ports capable of supplying up to 1.5A (vs. the regular 0.5A of USB 2.0). This is needed to charge Apple devices which require higher current and, in this case, is named EZ Charger. Let me go on a little rant here. For so many years, external hard drive owners had had to carry splitter cables or even AC adapters, not being able to power those drives from a single USB port. And not a single motherboard maker had done anything to help them. But as soon as Apple started rolling out its iDevices, the necessary charging capabilities were added. Apple makes world better, eh?